The Writer Chic: You little stinker! Even if you are an avid blog reader who keeps up with a gazillion blogs, you have your favorites. Those handful that stick out to you because they are funny, well-written, insightful. If you're lucky, the women who write those blogs are also women who you just feel like you connect with -- like if you lived in the same ZIP code, you'd be the best of friends. Well, Kendra is one of my favorites. I don't remember how I found her, or if she found me, but we somehow clicked. We faithfully read each other's blogs, and we've emailed. My only "criticism" of Kendra is that she, quite literally, lives on the other side of the country -- in Oregon. And that's just too far! But she quite wonderfully redeemed herself for that on Wednesday. Earlier this month, Kendra posted about these adorable baskets she'd found for a steal. And of course, I loved them, and told her as much in the comments. Well, sweetheart that she is, she offered to pick up a couple for me and ship them to Tennessee. (See, another pitfall to living so far away is that we can't rejoice over great bargains together if we don't have the same stores. Another boo!). Me: "Kendra, where are those baskets from? I MUST have them!" Kendra: "Fred Meyers. Do you have that chain near you? If not, let me know and I would totally be willing to pick ya up some and send 'em your way..."
Me: (trying to be diplomatic and thrifty, even though I TOTALLY wanted to take her up on her offer) "No, I've never even heard to Fred Meyers. And although I appreciate the offer to send me a couple, I'm going to resist and just keep making do with the baskets I already have in my half bath that look just like that -- it was more the fabric I feel in love with. You're a sweetheart for offering, though!" That is the cabinet in our downstairs half-bath. And on those shelves are the adorable Fred Meyers baskets that came all the way from Oregon to Tennessee, courtesy of Kendra. Just because! Isn't she the best, and don't they just look perfect? And kind of unrelated, but still fitting for this post. I've been promising my former co-worker and friend Michele that I'd show her pictures of the new house. Yea, I've been saying this since October. But you know how it goes. You don't want to post pictures of the new house with all the boxes strewn about, and then we were having the house painted, and I wanted the pictures to show the new paint...blah, blah, blah. Well, since I already had the camera out, I decided to tackle the pictures of the half bath and Seth's room (coming soon, I promise). But anyway, here is the rest of the half bath. It was the only room in the house that we didn't have painted. 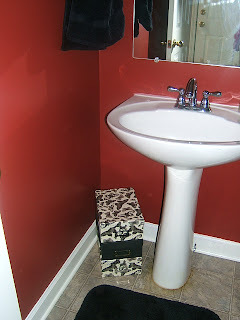 This was the color of our dining room in Ohio, and we both liked the idea of a red bath with black and white accents, so we left it. Ooh, look! A toilet! I know, the artwork looks like it's hung too high. I agree. But I was planning on putting something (any suggestions?) on the back of the toilet, so I thought I needed to leave the vacant space. I'm open to ideas. And equally exciting -- a sink! So, there you have it. Our half bath, made all that cuter by Kendra's thoughtful and surprise contribution. Thank you, Kendra! I love them! HA! When I saw the title "you little stinker" I assumed the post would be about Seth!! 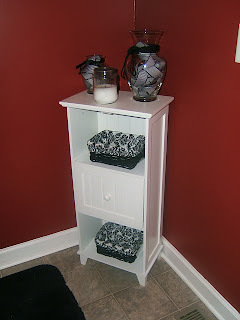 I am so glad you received them and that you like them =) They do go PERFECTLY in the half bath! Don't thank me, thank the Lord, because He laid you on my heart SO heavily recently...I just felt led. So, when you add the whispering of The Holy Spirit with the fact that the baskets were 25% off when I went back...it was just a no-brainer! Those baskets are great! I've never seen any like them before. I'm liking your bathroom... pretty colors! Love the red, white and black. Back of the toilet? Box of kleenex. Baby wipes? ;) hehe I love the 1/2 bath, Mon! 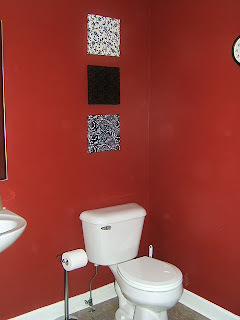 I'm fond of red bathrooms myself.